I have a number of woodtype fonts that need a good cleaning and would appreciate suggestions on use of pertinent solvents for different scenarios. While some of this type came to me simply very dirty from accumulated ink, some of my nicer fonts display a blotchy pattern on the letter surfaces, almost like fungus stains. Although one can’t feel the spots from rubbing the surface, those spots do not carry the ink as well as the rest of the letter. – What is a good method to loosen up accumulated ink without damaging the type too much? – And what solvent or other product might be aggressive enough to get at the staining without damaging the type itself? The blotchy stains are were the protecting shellac has worn away probably from solvents that break it down. You can re-condition your type by first cleaning the letter with lacquer thinner and a soft rag, to remove any dried ink and the remaining shellac. After allowing the type to dry well, make up a mixture of 1/2 shellac (orange) and 1/2 isopropyl alcohol, and using a soft brush brush a new coat of shellac onto the surface of the block. I use a medium quality flat artist’s brush 3/8’ or 1/2” wide. Brush a very light coat on, but don’t flood it. After it dries for a day, give it another coat. Shellac with alcohol will dry quickly, but don’t be fooled, underneath it is still soft and if you try to print too soon the ink can mix with the shellac and cause a whole new set of problems. The stains won’t go away as the ink and solvents have wicked down into the grain of the wood. Should add that I always cleaned my wood type with kerosene to keep the finish in good shape. Thanks very much Paul, I’m taking notes. Lacquer thinner I have already, shellac I’ll have to get. You mention ‘orange’, do you mean shellac flakes? For interest’s sake, do you know what makes lighter/darker shellac flakes more/less desirable for specific tasks? 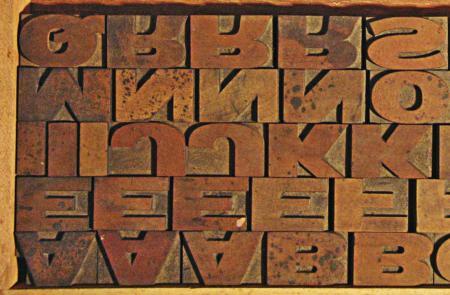 Lastly, would you give kerosene cleaned woodtype a quick clean with a plate wash before printing? Seems to me like the oily residue from kerosene might be undesirable…? Or would a clean dry rag be sufficient to get rid of the oil before a new print job? I would only clean wood type with anything stronger than Kerosene if I had the form on the press and needed to turn it around quickly. Kerosene doesn’t leave an oily residue, it evaporates like any other solvent, it just takes several hours to completely evaporate. Make sure to brush your type clean to keep ink build-up to a minimum. There are darker and lighter shellacs. I prefer the darker orange shellac so you can see the coverage you are getting. The reason that mould wont ink up is due to hydroscopy , that being that the fungal growth draws moisture from the atmosphere and is collected by the wood itself thus retaining moisture permanently , as mentioned above clean it lacquer it with a very thin mix of laquer and you are away again ! @Paul, thanks for clarifying the Kerosene and shellac. I use a lightweight ‘California Wash’ solvent in the shop, I’ll be looking for a small tin of Kerosene for the woodtype. @Peter, thanks for the insight on the mould. where the fellow sands newly produced woodtype with a shellac based sealer and finishes with several coats of tung oil. Would either of you concur on the tung oil finish? Oil based ink on tung oil finish, oil to oil, a good deterrent for moisture and mould? I would suggest that the tung oil wouldn’t be necessary. Tung oil is used to penetrate into the wood, and is less effective on already sealed wood. the mould once the type has dried out some will cease to be a problem i would just take a cloth to it with some fine paint cutting compound on it to cut the surface back a little and either lacquer it (unlikely ) or rub thin wax into it to prevent further damp ingress, dont use a silicon wax but fat wax like from bees . Best re-conditioner is a sanding sealer – used to fix problems with uneaven absorption of stains. I however would begin with lightly raising the wood grain, in a circular motion using 280/320 fine finishing grit paper, gently lightening the face of each woodtype, before an application of shellack sealer with a rag-cloth. Repeat twice, using 0000 wool instead, between coats. This process will not erase the ink-mould blemishes but provide a workable face for the types to be used and used, hopefully without sacrificing type-height. Once a Wax finishing has evaporated – depending on the preceding oils/ varnishes used – there can be a tendency of smear deposits that build-up and prevent the ink taking evenly and consistently to the form. I’d stick with the non-reactive coatings mentioned earlier.